The first few Sundays following the feast of Pentecost are set aside for the remembrance of the saints. The first Sunday is “All Saints,” much like the West observes on November 1. The second and third Sundays mark saints of national and other particular interests. In the Orthodox Church in America, we commemorate, All Saints, All Saints of America and All Saints of Russia, and lastly, All Saints of the British Isles and Ireland (noting the large number of American Orthodox who have British or Irish backgrounds). The Scriptures tell us that the saints stand about us as “a great cloud of witnesses,” as though we were living our lives in an arena. They cheer us on and urge us forward, always surrounding us with their prayers. Life is communion – never a self-contained biology – we exist by virtue of the fact that we are in communion with others. Even in death, our bodies continue in communion with the earth around it and the many life forms that increasingly inhabit our remains. Only in our imaginations do we exist apart from the life of others. Prayer is the most common expression of this communion, particularly with the saints. They pray for us whether we ask them or not, whether we want them to or not. Prayer is the voice of love. There are saints who are well-known, or at least, identified, in the life of the Church. However, most saints remain unknown to us, regardless of their roles in our lives. It should be remembered that Sodom and Gomorrah would have been spared had only 10 righteous men be found. As it was, the prayers of the righteous Abraham were not without effect. His kinsman, Lot, and family were delivered from the destruction of the cities at the hands of angels. It may be that none of us who read this post are among the saints whom I describe. But we can and must join our prayers with theirs (and with the hosts of heaven) as a veil of protection in a world that often seeks its own destruction. May God make us fervent in prayer on behalf of all and for all. I pray this meditation will be useful. I use this memory as a way of thinking about the phenomenon of saints. I do not know that my friend’s kindness approached that category – but it is a reminder to me that we are not all alike. Sometimes, for whatever reason, we meet those who are singular in their kindness, their goodness, their generosity, their compassion, and the presence of the good God is made somewhat tangible. I believe that without the presence of saints, the world could not continue to exist. They cannot be seen as a great political force, but I believe that the goodness that dwells within them and the kindness that flows from them, by God’s grace, hold back the approaching darkness that will come before the Light of God sweeps all darkness aside. But this other presence – to be found even at an early age – transcends our science. Not often recognized to the extent of Bishop Nikolai, these silent sentinels are nonetheless there. Their presence in an office can make an unbearable place of work into something bearable – even at times pleasant. I have no way to estimate their number or to surmise their universality, other than to suspect that they are everywhere. And I believe that they are where they are, because God placed them there and that they are where they are for our salvation. More than saints, they are like guardian angels in our social fabric. Without them, the whole world would unravel. 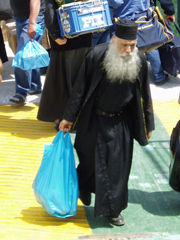 This entry was posted on June 28, 2011 at 12:02 pm and is filed under Orthodox Christianity. You can follow any responses to this entry through the RSS 2.0 feed. You can leave a response, or trackback from your own site. That was the most beautiful thing I’ve read in a very long time. Thank you Fr. Stephen. Yes, thank you, Father! I have recently become very aware of the lack of fervency in my prayers, the weakness of my prayers because I am so weak. I am so thankful for the fervent prayers of the Saints and all silent ones among us! Through the prayers of our Holy Fathers…Lord, Jesus Christ our God, have mercy on us and save us! Thank you, Fr. Stephen! I believe it was through this blog that I first became aware of St. Nikolai and this prayer for enemies. It has been a blessing and I certainly needed to read it today (and every day!). I also like “guardian angels of our social fabric” — such a beautiful picture in my mind. Glory to God for All Things! Yeah i liked the phrase “silent sentinels” too. You write rli well. I have only just got into reading the saints and there lives. Amazing people. Like you, Father Stephen, I married an ‘outsider’, moved away and forgot most of my high school friends. At the 50th high school reunion, I became much aware of what ‘good’ people I had been in school with. They contributed immensely to what little I have accomplished in life. This awareness has been humbling: fifty years after the fact, my eyes were opened enough to see how my classmates had blessed me for my lifetime. I am indebted to them with no means to repay. Surely, this is God’s Providence, which has caused me to wonder about the countless other persons through whom God has moved my thoughts and actions. You are among them as are many who reply to this blog. I am grateful for every one. Forgive me – but a few observations. I think what you are describing would be a largely moralistic/secular approach to the question of the love of enemies. It’s not a question of like or agreeing, etc., nor is there a question about self-defense. Christ does not teach the duty to defend oneself, nor to choose the lesser of two evils. I agree, that there are times that we do those things, but the canons of the Church offer penance and confession for someone who takes a human life (regardless of circumstances). These things flow deep in the mystery of our souls. As for Dostoevsky’s characters – The Idiot must be read in the context of all his novels – there is a Christian project that runs through them all. Prince Myshkin is not a successful attempt in that project (to portray goodness). It is probably best achieved in the Elder Zossima. The love of enemies is related to Christ’s self-emptying (and our own). What you describe is perhaps niceness to enemies, but does not seem to require that we follow Christ’s way of self-emptying – which is a commandment within the Scriptures (Phillipians 2:5-11). True love of enemy is frightening to the ego, for it represents the Cross of Christ in our lives. An acceptable Cross would seem to me to be too weak. Could you tell us about the photo, Fr. Stephen? It looks like Archbishop Dmitri but I assume it isn’t since it says “Greece”. Also, could you tell us how to view or obtain the movie about St. Nikolai? Does that passion being the first inclination of every father justify such an action on the offender? I think you are looking at the outward situation instead of the heart. If I kill a man who raped my daughter, would the world sympathize with me? Of course, but God looks at the heart. I would still answer to Him for such a sin. St. Nikolai Velimirovich is simply obeying Christ’s commandment to love his enemies, even if it does not agree with the judgement of worldly wisdom. Keep in mind that being rational in this philosophical way would lead us to reject Christ’s cross, His Incarnation, His Resurrection, etc. I hope that I am not misunderstanding your point. Love in Christ. Realist, Jesus’ action in the Temple is not an example to be used to justify human violence. As to your example – you offer an extreme – an extreme in which my action or reaction is not the proof of a cases but my confession. I would certainly act to defend my daughter. I am a small man, I doubt I could rip the head off a chicken. But I would certainly intervene. If the intervention saved my daughter I would be deeply grateful, also deeply sad because of our human condition, and if my intervention killed the man, I would be deeply remorseful. I do not want to kill anyone, nor do I want to want to kill anyone. My killing of such a man would result in (at the least) my suspension from the priesthood for a period of time. In some circumstances it could result in being deposed. The taking of a human life is a very serious sin. I admit I would do so to protect my family – though – to the truly holy – there are likely to be means of defense of I which I nothing. It’s not the “choice of a lesser evil” – it’s the choice of evil because my own darkened heart is unable to see or do anything else. I would suggest that you not take violence too lightly nor seek to justify it too easily with extreme cases. We are not Jesuits. We should seek the inner man of the heart and its purification. Otherwise we discuss things like two blind men arguing about what they cannot see. I come from a zealous theonomic/reconstructionist background and I understand completely what a-Realist is trying to communicate, and it is refreshing to hear how you put that mind set into an Orthodox perspective. Only the Orthodox could sway me from trying to justify violence, no matter how ‘noble’ or ‘loving’ the cause. The Orthodox perspective on these things is impossible to accept by simply analyzing the human condition with moral justice. When I was deployed in Iraq, I found this prayer by St Nikolai of Zicha. It gave me a lot of peace, especially during the scary times for me and for those in my unit. And it also gave me a lot of peace when pondering the craziness, mayhem, etc., that happens during war. It caused me to think of the stark contrast of Christianity vs. Islam — would a prayer like this ever exist in Islam? Hardly. It drove the point home to me even further that Christ is truly the Way, the Truth, and the Life. As you say on your blog Fr. Stephen, Glory to God for All Things! Realist, please forgive my misunderstanding. I probably should have read it more carefully. I would defend my daughter. If needed, I would sin to defend her. Is violence the only option in this “what if”? I don’t know. A good friend directed me to this post, so, both you and he are a blessing. 1 Sam. 25; Abigail tells David that he fights for the Lord, not for himself and David praises God for sending Abigail to remind him of this tenet before he went too far, by shedding blood needlessly. David was restrained from his rage and vengeance, by a holy principle, it is the same principle that led Jesus to a cross and it is the same principle that restrained the Holy Father from pouring my wrath back on me, when my sins drove nails through His Son. The issue of someone hurting my kids has been difficult for me. There was a time before I married that I didn’t want to have a family, because of this fear. I know that the adversary is aware that this is my weakness, so, I pray for strength to overcome. Yet, I also know that to overcome the temptation will involve facing my fear, in the flesh…, one way or another. It’s such a paradox that I even struggle to mention it in my silent prayers. It feels as if, by even acknowledging to God, that this fear exists, I am opening a “Pandora’s box” upon my children. Nevertheless, God the Father is a far better dad than I could ever hope to be, so, I will pray, trust, and hope. If I’m waiting on everyone else to enter the Kingdom before I begin to live in it, then no one will ever live in it. God is kind to the unthankful and the evil (Luke 6). Read the whole Scripture before quoting advice from some of it. Where do you get the idea of one person being “more worthy of our attention?” This is man’s philosophy and not the teaching of Christ. Mankind’s true life (“fullness” as it is understood in Orthodoxy) is participatory (God’s presence has pervaded everthing and everything therfefore has something to say about itself). We are sons and daughters. Jesus speaks of even the stones crying out. This is the kingdom. The problem is that man has completely forgotten what God looks like and therefore retains only vestigial ideas of what true life (“the kingdom”) is. I hve deleted a number of comments that seem to me to take the conversation in an unhelpful direction. The conversation in the comments is always moderated to some extent to hold to a topic. Wow. I am faced with a situation where I must forgive someone who is doing things that we are cautioned against, and that go against the commandments and the Bible. Forgiving, loving, and praying for that person and his family I can do. Allowing them back into my life in an active role I simply cannot. Is that not truly forgiving? They have no plan to cease the behaviors, and are not Christian. They practice witchcraft (Wicca) proudly; commit adultery as recreation with other couples; lie; steal; do drugs; and advocate openly homosexual practices for their 16 yr old son. The man was my stepson and I raised him for 26 yrs. He is 40 now. How do I apply what you are saying we need to do in this situation? I am not a Saint, but I genuinely want to do what Jesus asks of me. You are under no obligation to invite them into your home. We have an obligation to love and not hate. Pray for them and do not consider yourself to be in any way superior. But you may protect your home from the demons he brings. In this fallen world when people make the decision to do violence (no matter the reason) the Church in Her wisdom offers confession, penance and reconciliation. God is merciful. It is no different than any other consequence for one’s actions when we sin we have to be reconciled in order to heal. If you kill someone in defense of another or in self-defense you have still caused harm. If I harm another person I am still responsible for the harm that I do before God just as they are responsible for the harm that they are inflicting. Justification for violence is just another way of seeking approval for missing the mark. Please do not misunderstand. What I am speaking to is our personal responsibility before God. There are situations that we can be placed in that are obviously “damned if you do & damned if you don’t” dilemmas. Thing of it is, we can only do our best at the time with what we know to be right, pray to God to have mercy and confess our transgressions. Thank you Fr. Stephen! I appreciate the answer. I have not discussed it with my parish priest yet, and I am sure the answer would be much the same. It is such a difficult situation. We broke off any relationship over a year and a half ago – over lies and thefts. Now he is back and wants to be in our lives again and I don’t want that. Thank you for helping me see the way I should deal with this. You are, as ever, a blessing – to all of us. Don’t tie yourself up in trying to figure things out. Just do the best, in communion with God, with things as they present themselves to you. We do not need to figure out the world – just live in it. But finally, violence only gains a short term reward. But to serve God grants as an eternal reward. Don’t worry about the circumstances that seem to push these into contradiction. Do your best to follow God, and go to confession and communion regularly. We don’t have to figure out all of life. Thank you from my husband Michael too – for reminding us that the behaviors are truly demonic influence. I will love the person and pray for them – while seeing the demons for what they are and ask Jesus to free them. Blessings to you too father. A very helpful post, indeed. I have seen “churchless Christianity.” In my experience it does not work for a large number of reasons. The Church is not man-made nor a legal institution – but those within it can certainly be corrupt or misguided, etc. But it is Christ we encounter in the mysteries of the Church. And it is humanity (my other self) that I meet within its walls (and outside as well). It’s like marriage. You can do most of the marriage stuff outside of marriage, but there will be no union – no mutual surrender. It is far less likely to work for your salvation. Your struggles, frustrations, worries, etc..can be viewed as your Cross. Take it up and pursue Victory. I would even go so far as to encourage you to thank God for providing you with this opportunity, though I know it hardly seems as such. I, too often feel old and tired from dealing with the daily challenges of our earthly life. I’m 43, married, with 3 children. I sometimes encounter situations where I want to appear to my family as a strong leader, yet remain peaceful and forgiving. I’m also in a positon of authority at work. Its very difficult. Don’t overlook your struggle and these questions that you can’t help but ask. That in itself is significant and in contemporary times for someone of your age, quite rare. Pray, read the Gospels, and pray some more. Who knows where it will lead you? I think we overlook the role of the civil magistrate here. The magistrate, and only the magistrate, wields the sword to punish and restrain the evil-doer. In our parish, we pray daily at the altar for righteous government and the strengthening of the arms of those who need to heed duty’s call. Anarchy is worse than tyranny.